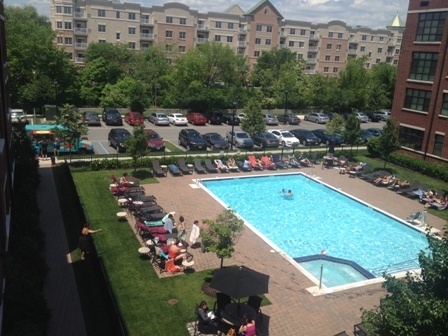 ENGLEWOOD, NJ – Visitors to The M at Englewood South were recently treated to a first-hand look at the incredibly social and active environment that has made the collection of upscale condominiums one of Bergen County’s most popular new home communities. While the calendar might not recognize the formal start of summer until this weekend, residents of The M got a head start on celebrating the lively season with a festive “Homeowners Appreciation Day” held on June 14th at the community’s sparkling outdoor pool. Hosted by Flatrock 3 LLC, sponsor of The M, the event officially welcomed homeowners to enjoy to one of the most popular recreational amenities at the community. Held under sunny blue skies, the well-attended party provided an opportunity for residents to relax and socialize around the resort-inspired pool and featured homeowner gifts including beach balls, flip flops and free hot dogs. Summer is an exciting time for prospective purchasers at The M thanks to seasonal incentives that add up to significant savings at the commuter-friendly neighborhood. For a limited time, homebuyers can receive $7,500 off one-bedroom homes and $15,000 off two-bedroom condominiums at The M.
“We also have a select number of Immediate Occupancy homes available, meaning a few lucky buyers can be residing in their new condominium in time to enjoy summer at The M,” Mr. Hollenbeck points out. The energetic atmosphere at The M at Englewood South is fostered by the large number of young couples, single-professionals and growing families who are drawn to the affordability created by the special buyer incentives and already attractive pricing from just $298,000. The M boasts a collection of inspiring single-level floor plans adorned with elegant designer finishes and appointments. The expansive layouts range from 797 to 1,499 square feet of living space and feature open layouts, sumptuous bedrooms, state-of-the-art kitchens with maple cabinetry, under-counter lighting and granite countertops; large laundry areas with side-by-side General Electric washers and dryers, large walk-in closets and additional powder rooms in most homes. In addition to the outdoor pool, on-site recreational amenities that bolster the desirable lifestyle at The M include a resident’s clubroom with catering kitchen for large parties and entertaining. Residents also receive a one year membership at The Gym, a 40,000 SF state-of-the-art fitness center located at 20 Nordhoff Place. Located at 104 Riverview Avenue, The M offers residents a best-of-both-worlds setting that blends key suburban conveniences with sought after urban appeal. Englewood’s dynamic downtown features an eclectic offering of upscale shops and boutiques and more than forty five restaurants and eateries. Major brand name shopping can be found at the nearby Riverside Square Mall and Garden State Plaza, while the Bergen Performance Arts Center in Englewood features nearly 150 world class performances yearly, ranging from Rock and Classical music to Comedy and Dance performances. For more information on The M at Englewood South, please call 866.650.3842 or visit http://www.LiveAtTheM.com.